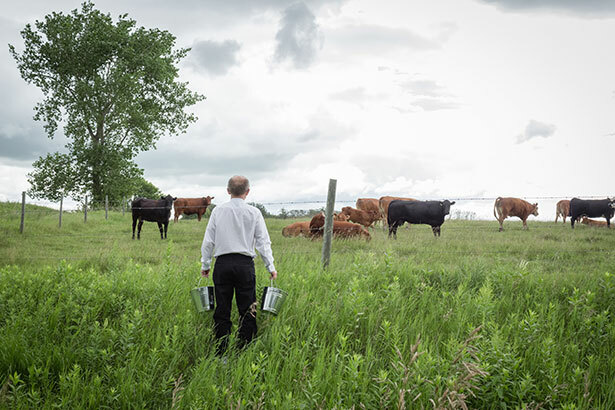 As consumer desire for local, grass-fed meat grows, it’s increasingly difficult for farmers to meet the demand due to a shortage of government-inspected slaughterhouses. The same expensive USDA regulations that drove many small slaughterhouses out of business also prevent the sale of meat to consumers unless it has been processed in a USDA-inspected facility or under a state inspection program with the exact same standards. With few slaughterhouses available to farmers, many have to haul their animals for several hours, resulting in increased expenses, higher prices for consumers, and unnecessary stress on the transported animals. “Custom” slaughterhouses, for which states can set their own inspection standards, do exist, and many farmers already have much closer access to one of these facilities. But current federal law states these facilities may only process meat for the person or persons who owned the animal when the slaughter took place. This means the customer(s) must buy the whole animal while it is still alive – buying a large amount of meat all at one time, without even knowing how much meat they’ll end up with or what their price per pound will be. This is not feasible for most farmers or consumers! There is a simple solution. H.R. 2657, the Processing Revival and Intrastate Meat Exemption (PRIME) Act, would empower states to set requirements and limitations on custom processing facilities as each state deems appropriate. The PRIME Act enables in-state sale of custom-slaughtered beef, pork, lamb, and goat to individual consumers, restaurants, hotels, and grocery stores. Passage of the PRIME Act would support small farmers, decrease stress on their animals, and improve consumer access to locally raised meats. Special thanks to Representative Thomas Massie (R-KY) for sponsoring the PRIME Act! The original co-sponsors are Representatives Chellie Pingree (D-ME), Justin Amash (R-MI), Kevin Cramer (R-ND), John Garamendi (D-CA), Glenn Grothman (R-WI), Jared Huffman (D-CA), Walter Jones (R-NC), Raul Labrador (R-ID), Zoe Lofgren (D-CA), Tom McClintock (R-CA), Mark Meadows (R-NC), Jared Polis (D-CO), Dana Rohrabacher (R-CA), Mark Sanford (R-SC), and Robert Wittman (R-VA). They have been joined by Representatives Dave Brat (R-VA), Jason Lewis (R-MN), Bruce Poliquin (R-ME), Andy Biggs (R-AZ), and Steve King (R-IA).